because I’m not hungry enough to eat six. Recently, my wife, Kathy, and I decided to turn our new locally sourced meal activities to a food that could arguably be called a national obsession. According to reliable Google searches on the topic, most Americans, when asked which food they would choose if they could only eat one for the rest of their lives, would choose pizza. Americans are so devoted to this food choice that we actually have National Pizza Month (October, for the uninitiated) and pizza has obtained icon status by having its own app for iPod. The ease with which we planned our Localvore pizza was a testament to how quickly Kathy and I have made the transition to the “as close to home as you can” crowd. The crust was going to come from homemade dough using our fresh batch of whey that had been skimmed off the mozzarella cheese made only two days before. The sauce would be made from fresh tomatoes from the garden that we had frozen whole last summer. Toppings would include caramelized sweet onions from Georgia (if you can’t get it here, go near), the fresh mozzarella, whose successful production we owe to Kathy’s attendance at the Off the Vine sponsored cheese making event, and local sweet Italian sausage from our Off the Vine order. As we tinkered with the finer details of the dish, I found myself drawn down the mozzarella-paved streets of my youth. Pizza was one of the four food groups on the Verano family food pyramid. No party was complete without steaming slices piled high, no local food shop worth its oregano would leave it off the menu, and no one, and I mean no one, ever uttered the phrase, “What, pizza again?”, unless it was followed by cheers. Eating pizza meant three sure things in our home: you were going to be reminded not to stretch the cheese to the ceiling, you would always burn the roof of your mouth on the first bite, and you were always going to hear dad tell the story about how his Italian family invented pizza. One of the Verano children: This pizza is great; we ought to open up a pizza shop. Another one of the Verano children: Pitta? Dad: Yep, that was our pizza. If only we had known, imagine what we could have done. All the Verano children (laughing silently to themselves): Pitta? Was dad trying to tell us that we had the pizza rights stolen out from under our long Italian noses? Could there be proof that the Verano’s were due a slice of the billion dollar industry that is Pizza Hut? For most of my upbringing, there was never any attempt to verify this story and I chalked it up to dad’s love for food and telling stories about food. Then it happened; at an annual family reunion, my father was reminiscing with one of his seven brothers and the pitta story came up. However, this time there was more, there was a recipe! Finally, after all these years, not only was the story being corroborated, but also I was finally going to learn how the Verano name almost became as popular as Chef Boyardee. My uncle explained, “Mom would get a big loaf of bread, cut it in half and cover it with olive oil. After that, she’d put cheese, garlic, tomatoes, peppers, whatever she had on top.” “That’s not pizza, that’s an olive oil sandwich,” I almost said aloud. Instead, I looked at my brother with the shared understanding that we had no claims to culinary espionage and that we were never going to be pizza, or pitta, moguls. The final slice to this story came a few years ago while my father was visiting and we were engaged in one of the three family traditions still going in the family. When not eating food, when not talking about food, we would watch someone on TV making food. On this particular evening, we were watching the show Ciao Italia. When the host, Mary Ann Esposito announced, “We’re going to begin the show by making a Calabrian pitta.” (Click here for the YouTube video of that show http://www.youtube.com/watch?v=sBTXxbShJ8Y) Stunned, I turned to my dad and said, “Calabria, that’s where we’re from.” Mary Ann then went on to create a wonderful dish that so closely resembled what my father had been talking about all these years, I actually got the shivers. The evening that Kathy and I successfully created the Localvore Pizza, we sat marveling at its fresh taste. 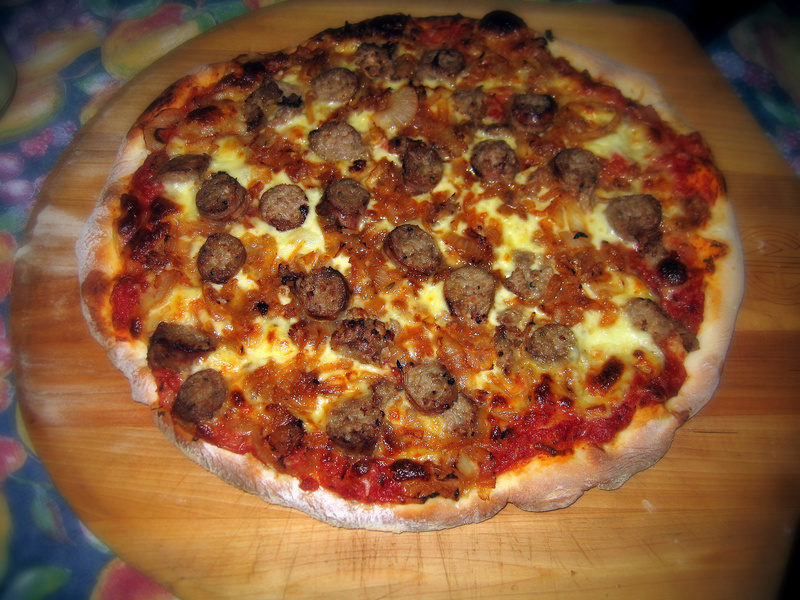 The caramelized onions played nicely against the sweetness of the fresh tomatoes in the sauce. The whey- infused crust was firm and held up to the extra load of fresh mozzarella. The chunks of sausage had their own balance of sweet and spicy, as well as a slight crunch from being baked in a 500-degree oven. I held up a piece to Kathy and said, “This is definitely not how Pop would have done it, but he would’ve loved it.” “To pitta,” Kath replied, raising her wine glass. “To Pop,” I replied. 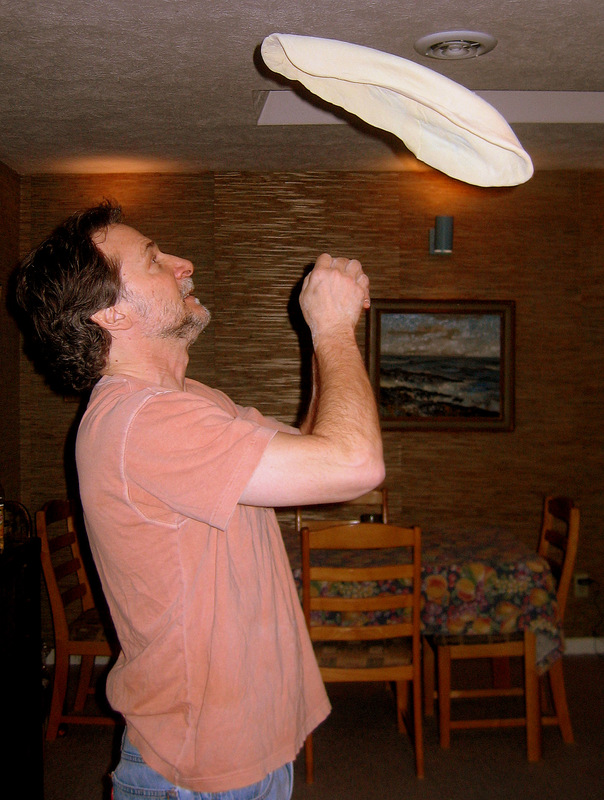 This was not photo shopped...that dough is in the air.